Let’s be real… most high school graduates don’t know how to truly manage their money effectively. It’s just one of those things they don’t teach you in high school (but really should). I was a hot mess when it came to figuring out all my finances once I got to school (Where were the articles on financial advice for college students 10 years ago?!). I found myself taking out student loans without even thinking about how I was going to pay them back in the future. All that mattered was what I wanted the money for in that moment – eating out with friends, going on weekend trips, and so on. It wasn’t until my junior year that I finally realized how financially unsound some of my decisions were. Sure, I had a few part-time jobs that were helping me pay the bills, but I was nowhere near prepared for graduating – especially with thousands of dollars in student loan debt (You can read about how I’m tackling that at 7 Tips for Paying Off Student Loans). 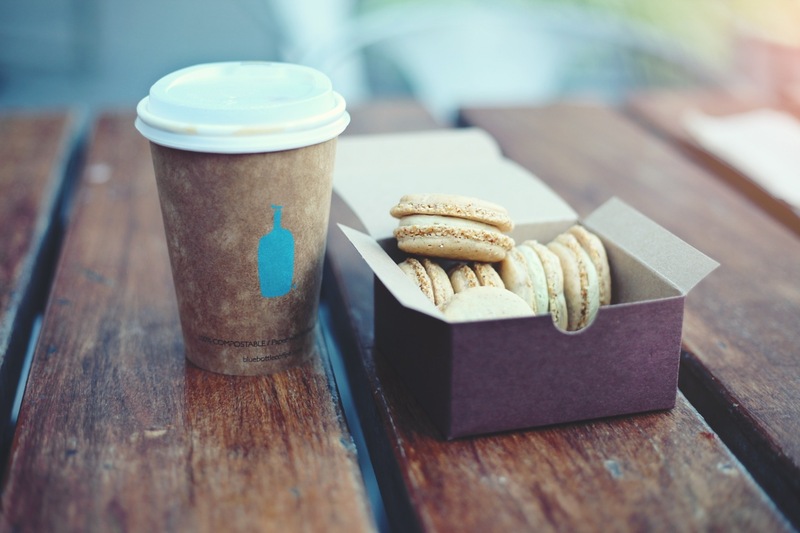 Now that I’ve been ‘adulting’ for five years or so, I’ve learned so much more about managing my money – things I wish I had known before I jumped into my college years. That’s why I want to share my financial advice for college students. Please keep in mind that I’m not a financial expert by any means, but I am a college graduate who has been in your shoes and understands how tempting it can be to borrow and borrow without thinking about the consequences. My hope is that you will leave this page thinking about what you could be doing differently do set yourself up for financial freedom in the future. If you’re already on the path, you get a gold star! Keep up the good work! If you sound more like more story, then I hope this financial advice helps you get on the right track. Most students gawk at the sight of a financial aid award letter. It might have something to do with the big “Congratulations! Here’s $$$$$$” they put in the center of it. Although receiving financial aid is a good thing, it can also sour your finances if you don’t pay attention to the details of it. Read Financial Aid Tips from a Former College Student to make sure you cover all the bases! Ultimately, you need to figure out how much your college expenses are going to cost each year. Once you have an estimate of what that number is, look at your award letter and see what grants and scholarships you were offered. These don’t need to be paid back. Now, subtract the amount of money you received from grants and scholarships from the estimated total you wrote down earlier. The number you have left is what you need to focus on. If you’ve exhausted you’re other options for paying for college (Make sure you followed these tips – Money Saving Tips for College Students: Save Thousands) and you need the money to be able to attend school, then you may need to take out some student loans. This is where some of my best financial advice for college students can be mentioned: Do not. I repeat. DO NOT borrow more money than you need. I know the financial aid office probably offered you a few thousand dollars over what you need. I know it sounds tempting. But don’t do it! Instead, I want you to evaluate each loan you were offered. Look at things like interest rates, whether it’s subsidized or unsubsidized, and if its federal or private. Once you’ve found the best option, contact your school’s financial aid office and tell them how much of the loan you actually want. I’m not saying you shouldn’t enjoy yourself and buy a few things here and there; rather, I’m reminding you to be mindful with your funds and think toward the future. If you get nothing else from this post, at least remember that the best financial advice for college students is to think in the future rather than in the moment. Don’t let the dollar signs blind you. College takes freedom to entirely new level. You no longer have your parents guiding you (or micromanaging you – however you want to look at it) to make certain decisions. No… It’s all on you now. Although this freedom is often welcomed with open arms, it’s often accompanied by temptations to spend, spend, and spend some more. My financial advice for college students who tend to splurge or are tempted easily is to set up a weekly activity fund. Once you’ve drained your funds, you have to wait until the next week to spend money. It seems so simple, yet so many college students fail to keep a budget. I get it – you have online access to your bank account and you have an app on your phone that calculates everything for you. Technology is awesome that way! Unfortunately, most students fail to even use simple tools like that. When you fail to look at your funds consistently, you may drain your account without even realizing it. 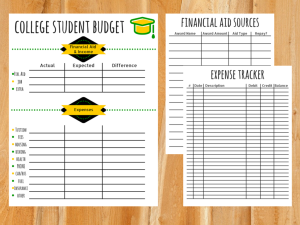 Since I know you’re really busy with your studies, I’ve done all the legwork for you with my FREE budgeting printable for college students! 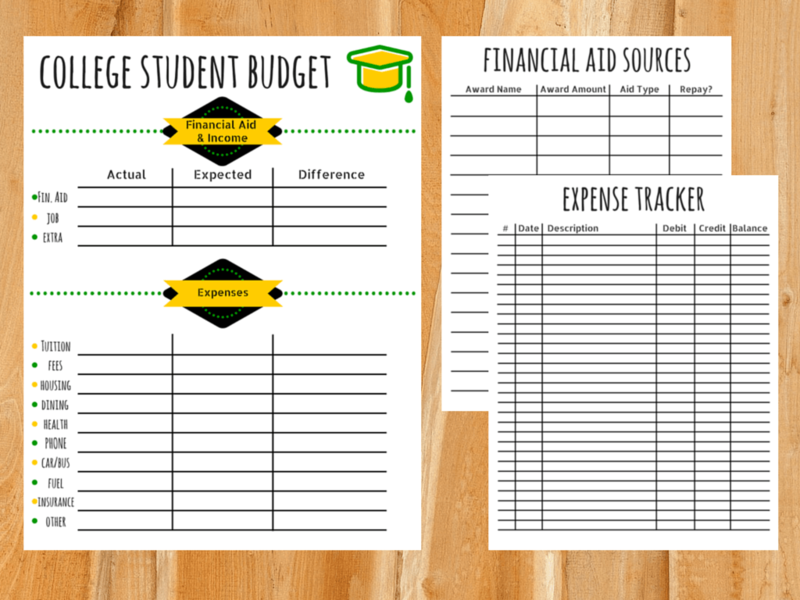 This is a great tool to help you keep track of your finances and it’s completely geared toward student expenses! I think there’s this underlying assumption that once you start college, you can’t look for outside grants and scholarships anymore. My financial advice for college students who are already enrolled is to keep looking! I know that your schedule is full of studying and going to class, but try to take a few minutes here and there to look for more financial aid. There are plenty of scholarships that are for upperclassmen and students who are pursuing certain majors. I never would have considered taking a finance or investments course when I was in school, but now that I’m giving financial advice to college students, I definitely have to put this on the list. When you graduate and get your first job, you’ll most likely have the option to invest in a 401K or other investment portfolio. Being able to understand your options and what risks are involved is extremely valuable knowledge to have. If you don’t have a course like this available at your school, try looking for one at a local bank. There are also plenty of free resources online! 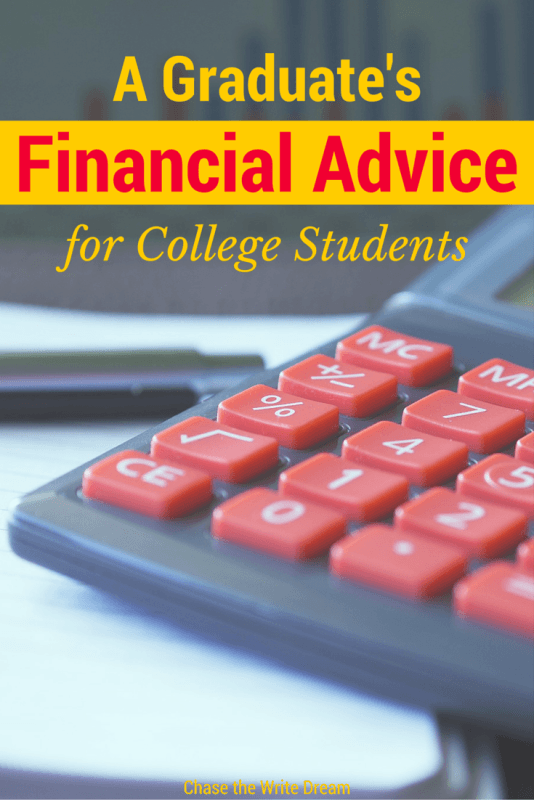 Use this financial advice for college students to help you establish a plan. Take the time to understand your finances and don’t be afraid to ask for help along the way. Knowledge truly is power when it comes to money management! Find More College Info Here! I would definitely recommend a finance class. Even just having a basic knowledge will make a huge difference for your future.